I spent yesterday evening at a showing of the V&A Museum's latest exhibition entitled All of This Beings to You – and there is one highlight I'd recommend any technology fan checks out. The V&A is now the home of the laptop Edward Snowden used to give leaked materials over to The Guardian newspaper. 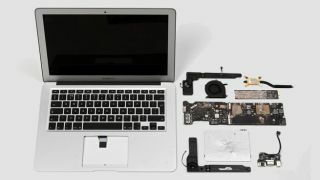 That exact MacBook Air is now on display in all its damaged glory after The Guardian journalists took to it with angle grinders and drills in a display to British security agency GCHQ. The act was called "a peculiarly pointless piece of symbolism" by Editor of The Guardian, Alan Rusbridger. It's a curious piece of modern history and this little computer undeniably changed the world and the way we trust Western government. The exhibition is designed to "explore the role of design and architecture in defining civic identity, technology, security, citizenship, democracy, the public realm and urban experience." It was opened up for the evening to promote the new BlackPhone 2 as the original BlackPhone also features in the exhibit alongside the Onion Pi, Cryptophone, the WikiLeaks scarf and the phenomenon of the selfie stick. The exhibit will be running until July 19 this year – plus it's free to enter – so get down there now to check it out.